The Flea at La Tienda is a monthly event that runs from May through October each year. It’s always on the 3rd Saturday from 8:00 am to 2:00 pm. 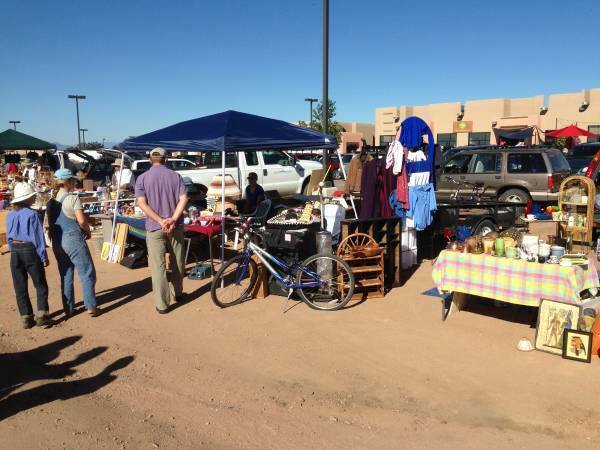 With ample parking, a convenient location just off I-25, and a great community vibe, The Flea is the flea market in Santa Fe. Call (505) 930-4821 for more information. NOTE: We are currently considering adding more markets each month (Bi-monthly or weekly) and are taking input from the community. Please email your thoughts and comments to destinyallison (at) aol (dot) com. How successful is it to sell garage sale type items? Depends on the market and who shows up, but vendors have been very happy. If you are with a direct sales company (wellness health) are we allowed to set up here? We went to the flea market today It was awesome. So much batter than any other around Santa Fe. Would love to have them more often. I would also like to be a vendor there this summer. Will definitely go back. Wonderful! So glad you enjoyed and so appreciate you taking the time to let us know. We were planning on selling but not enough time to pull it together. Next month! Awesome. Look forward to seeing you! I am in Roswell so would definitely love to have more opportunities to come to the Flea in Santa Fe! Bi-weekly is my vote. Hello Destiny, I am filling out the vendor information sheet and it asks for space reservation. We’d like to view the map and possibly reserve a spot prior to sending in our payment and form. Thanks! Thanks for reminding me to update the form. I no longer do space reservations because I’m not providing tents anymore. Had a micro burst that came through and took down our big ones and that was enough for me! Spaces are first come, first serve and there aren’t really any better ones. Call us at 505 428-0024 with questions. Thanks. I play Celtic harp and was wondering if I could bring it to play on in our booth (we’ve already bought our ticket) to give me something do while waiting for some sales? That would be wonderful. We have a musician on the stage from about 9:30 – 11, but if you park on the far end, away from the stage, you shouldn’t interfere with each other. Will you have a Flea on Oct. 21? We want to show thousands of beautiful buttons from our collection at ButtonBird.com. We used to own Santa Fe Fabrics and we’ll bring THAT many great buttons. If you’ll be open that is. Will be fun to hang in Eldorado again, we miss you all! Hi Nancy and Jack. The flea will be on October 21 from 8-2. Set up is 6:30 – 7:30. Looking forward to seeing you both. Trying to find out about what it costs to set up . It is $20 if you register in advance, $25 same day registration.